A picture is worth a thousand words. That is especially true in the construction industry. Workers can write a book's worth of reports (and by the end of a major project, they generally do) on everything from payroll, to subcontractors, to equipment, but no matter how well-written the narrative, written reports certainly can't compare to the photo array of a construction protect coming to fruition, step by step. Or an actual look at the land that will become incorporated into a project, with all of its pros and cons. Or a "selfie" of the on-site "swamp" that workers fear will become a safety issue if allowed to remain. And these "thousand word" pictures need not be static ones either. One no longer has to be a master camera man or have ultra-expensive equipment to reliably capture clear, real-time activities of work-in-progress, deliveries, and other active construction site photographs. This is not to say that managers should chuck written reports in the trash and focus on just those photos, by any means. 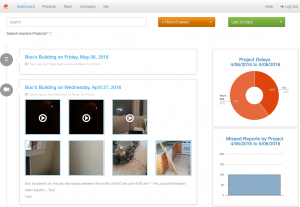 The best and most complete construction site reporting features both. The result of this construction photo management is information that is easy to interpret and pass on via the Internet to executives and shareholders. No more numbers on spread sheets to puzzle over with this construction photo app! Managers should be warned that while state and federal government rules allow workplace activity to be filmed and photographed, there are restrictions, such as no sound recording or photography in personal areas, like employee break rooms and restrooms. These restrictions can vary by state, as well. But for managers diligent about compliance, and willing to embrace software with visual capabilities, the results are a better informed, more proactive management team, better able to a keep a project on track because they can literally see what's going on, no matter where they are.